– Improve student learning outcomes using Connect our easy-to-use homework and learning management solution that embeds learning science and award-winning adaptive tools to improve student results. - Highlights strong International/Global orientation and links OB concepts and theories with reality. 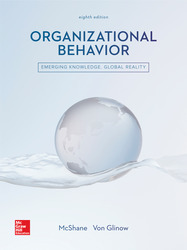 - Presents the reality that organizational behavior is not just for managers; it is relevant and valuable to anyone who works in and around organizations. - Offers instructors rich resources for active learning and critical thinking to engage students.